Like many weddings throughout the world, Russian wedding is full of traditions. Prior to the wedding day, they should rent bridal dress and groom’s suit and buy several accessories. They also need to rent a vehicle which is usually a limo, book a restaurant where the celebration will take place and hire photographer and cameraman. While in other countries, payment of dowry is just like payment to bank, then payment of dowry is a whole different in Russia. It even has different name which is called “ransom.” Why ransom? Let me tell you a story. 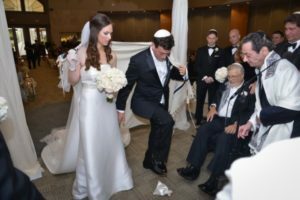 Prior to wedding ceremony, bride’s parent “kidnap” her and hide her. Bridesmaids set up a series of challenges for her fiance before he can meet the bride-to-be. They make the challenge to know the strength of his love and also embarrass him. If he cannot complete the challenge, he should make payment to the bridesmaids as compensation. The payment can either be cash, chocolates, or flowers. There are two other ways to do that. One way is that dressing up a male relative of the bride in wedding attire. The fiance cannot meet the real bride-to-be until he make payment. The other way is presenting the fiance with a napkin with lipstick prints. If the fiance cannot identify the bride’s print correctly, he should make payment. The betrothal is the first part of a traditional Russian Orthodox wedding ceremony. To do this, the couple stands at the entrance to the church to receive blessing from the priest before the ceremony begins. The priest gives them lit candles which includes a prayer and scripture readings. They should hold them throughout the ceremony. 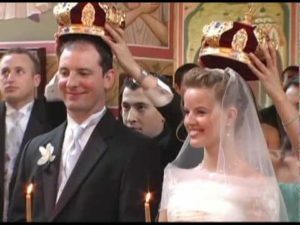 Russian Orthodox followers believe that placing crowns onto the heads of the couple is more important than exchanging wedding rings. To do this, the couple stand on a piece of red cloth and the priest places the crowns onto their heads. Their relatives or friends can place the crowns, instead of the priest. Then, the couple shares a cup of wine. After that, the priest go around the lectern three times. The act represents their journey into married life. Traditionally, the couple should wear the crowns up to eight days after the wedding ceremony. Nowadays, however, they take off their crowns after the priest announces the union and says the benediction. Parents of the couple give them a crystal glass after they officially becomes newlyweds. After receiving the glasses, they smash those glasses into as many shards as possible. Each shard represents a happy year of their marriage. The bride will release a balloon with her maiden name written on it. This is to represent that she is ready to start the new life with her new name. After they register to registration office, the newlyweds goes on a journey to visit several landmarks. At each site, they get photos and carry out traditional things. They actually may do this task by themselves. However, a small group of friends and family usually accompany them during the journey as well. Traditionally, Russian couples marry before they turn 24. Therefore, there are a lot of games set for them during the reception. The games include the couple going against each other to dress a doll, guests voting for the gender of their first baby and guests finding the couple who are hiding somewhere. 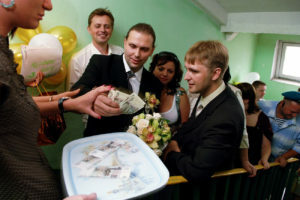 If the guests who come to a reception usually just enjoy the hospitality, in Russian wedding, they have to pay for the food and everything they consume during the reception. 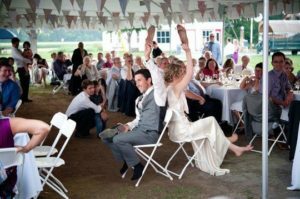 The payment represents friends and family’s support for the newlyweds to start their own family. 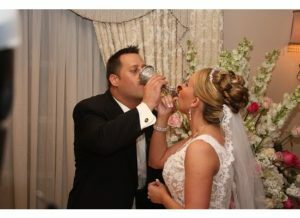 During the reception, the newlyweds and guest have wedding toast. When they have the wedding toast, the guest usually shout “Gorko!” which means bitter. The shout is a signal for the newlyweds to kiss. According to Russian tradition, the sweetness of their kiss will turn out the ‘bitter’ drinks. In addition to shouting the word to star the kiss, guests will count how many seconds the kiss should last. The length of time of the kiss represents the strength of their love for one to another. 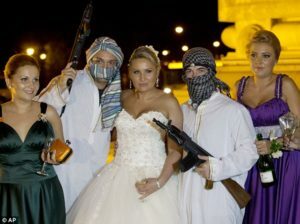 The second kidnapping is similar to that of prior to the wedding ceremony. Only this time, the ones who kidnap the bride are the guest who can either be her friends, relative or everyone who are present at the reception, as long as not her parents. The objective is the same, which is making the bridegroom pay for ransom. Before the newlyweds leave the reception, they should they take a bite of a salty traditional bread loaf. It is believed that the person who takes the biggest bite will become the head of their future household. Those are 11beautiful and unique Russian wedding traditions. Which tradition that you are considered as the most unique? You can also read traditions of how Russia celebrates victory day.